The Pennsylvania Department of Environmental Protection is reviewing a proposal to create a fracking wastewater treatment facility upstream from territory belonging to the Seneca Nation, which staunchly opposes the project. 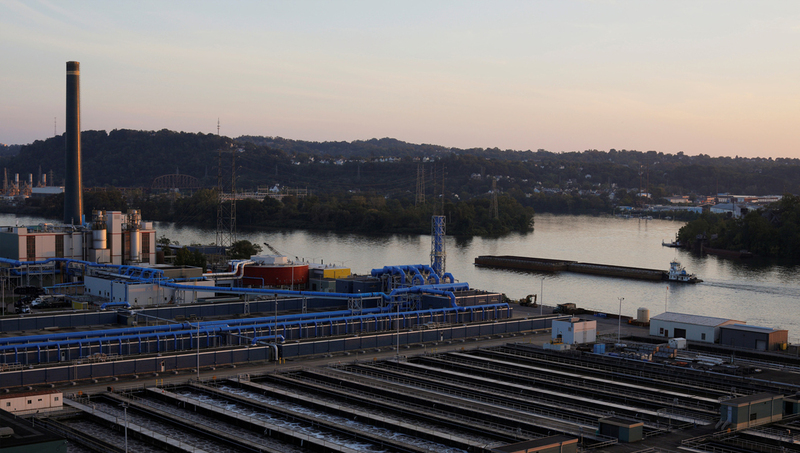 Late last year, a Pittsburgh-based company, Epiphany Water Solutions, obtained a lease to build a fracking wastewater treatment plant in Coudersport, Pennsylvania on the Allegheny River. As part of the proposal, Epiphany is building a distillation process facility that will discharge 42,000 gallons of treated wastewater back into the river per day. Those in favor of the project argue it will bring jobs and tax revenue into the area, and Epiphany has argued against all claims that their proposal poses any risks. But locals have expressed an array of concerns, from polluting the Allegheny River to contaminating an elementary school one mile away. The proposed site for the project is 65 miles upstream from the Seneca Nation’s Allegheny Territory, which has incited opposition from Seneca Nation leadership. “Allowing this plan to move forward would permit poisonous contaminants to travel downstream into New York State and onto the sovereign ancestral lands of the Seneca Nation, which sit upon the Ohi:yo (Allegheny River),” Seneca Nation President Todd Gates wrote in a letter to the Pennsylvania Department of Environmental Protection, urging the agency to reject Epiphany’s permit applications for the project. Gates noted that contaminated sediment and inadequately treated fracking wastewater from the plant will build up in the Allegheny Reservoir, located in Seneca Nation territory. The area is also prone to floods, posing the threat of a major spill, which would have severe effects on the Allegheny River. Gates added, “Allowing pollutants to be released into the river and transported downstream would create imminent health risks for thousands of residents of Pennsylvania, New York and the Seneca Nation.” Neither Epiphany nor the Pennsylvania Department of Environmental Protection consulted the Seneca Nation about the proposal. Fracking wastewater includes a combination of natural and man-made toxins, including uranium, which breaks down into radium and makes the wastewater radioactive. The federal government has resisted calls to require companies to disclose the chemicals in fracking wastewater, leaving it up to the states to do so. New York, Vermont, and Maryland have outright banned fracking due to the health and environmental impacts of the practice. In 2015, 1.7 billion gallons of fracking wastewater was created in Pennsylvania alone. A 2017 study conducted at the Conemaugh River Lake in western Pennsylvania by Penn State environmental engineering professor Bill Burgos found “large quantities of oil and gas wastewater with high loads of chloride, barium, strontium, radium and organic compounds left high concentrations in the sediments and pore water.” A study published earlier this month by Duke University found that “the disposal of even treated oil and gas wastewater causes large accumulation of radium isotopes in the impacted sediments” at three disposal sites in Pennsylvania. “You’re dealing with a very complex mixture coming from presumably just gas wells, but it could be oil wells as well, because those have operations up there as well. It can have complex chemistry of metals and radioactive materials as well as the salt,” said Dr. John F. Stolz, director of the Center for Environmental Research and Education at Duquesne University, in an interview with The Real News Network. He noted that other existing facilities in the Allegheny region have reported contaminants of radioactive materials within their systems. While the radioactive metals can be precipitated out, surfaces they come in contact with can become radioactive and the entire process develops a sludge byproduct, which will either be hauled off for disposal or sit in roll-off containers until its mixed with other byproduct to reduce it to acceptable radiation levels. Epiphany has only developed smaller scales of this distillation process, posing questions that scaling up may have unintended side effects. “This stuff will need to be decontaminated, this stuff with have to be monitored, and part of the problem is that the system is going to be completely automated, and according to what I read in the permit, they’re talking about having one to two people on site at any particular time,” Stolz said. Under Epiphany’s proposed plan, it would process fracking wastewater from JKLM Energy’s shale wells, discharging that water to the Coudersport Area Municipal Authority sewage plant where it will then be dumped into the Allegheny River. Wastewater from JKLM Energy’s fracking wells have tested positive for radioactive material. The Pennsylvania Department of Environmental Protection closed the public comment window for the project on January 29, as the agency reviews the project proposal for final approval. The department told the Real News Network that there is no timeline for when a decision on the Epiphany permit might be reached.